Unnatural History Comes to D.C. Between a frozen yogurt shop and a Latino fried chicken franchise on 14th Street, a new establishment features a "species assembly kiosk" -- and bottles of unicorn tears. 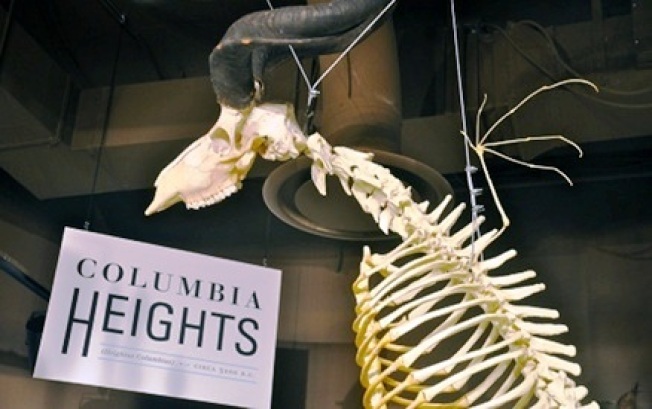 The Museum of Unnatural History is the newest, and perhaps least likely, addition to the Columbia Heights neighborhood. The Saber Tooth Dental Floss, Existentially Distraught Wood, and canned Primordial Soup may draw people in, but it’s all to a larger purpose. The "museum" is the storefront of the new home to 826DC, the District’s chapter of the national writing center founded by author and editor Dave Eggers in San Francisco eight years ago. It’s the first permanent home for 826DC, which started off as the Capitol Letters Writing Center and joined the Eggers project earlier this year. Each of the eight 826 centers has its own storefront theme, such as a pirate supply shop at the original 826 Valencia in San Francisco, and the Brooklyn Superhero Supply Company in New York. Joe Callahan of 826DC told me the Museum of Unnatural History was the brainchild of two volunteers. "We wanted a imaginative, whimsical and engaging theme that could be enjoyed by children and adults alike, and poking fun at 18th and 19th century explorers, many of whose artifacts fill museums across the city, seemed like a natural target," he said. "By using this theme, we are able to ground our work in larger academic discussions of science, history, geography and archeology, among others." While 826DC focuses on helping city students with writing, tutoring in other areas is available as well, which the scientific theme displays. "Our goal is to provide one-on-one attention to as many D.C. public school students as we can, to inspire students to write and explore their creativity, and to support teachers as they work with their students," Callahan said. So while the new space contains odd collections of bones, doors that don’t go anywhere, and a sign pointing to a bathroom for dinosaurs, It also houses tutoring space, a library, and more than a dozen MacBooks for student use. "The artifacts are a combination of donations, items we purchased, and creatures we invented," Callahan said. The museum "is based on the story of fictional explorers who share their findings and chart a fantastic world. Our hope is that through this theme, we will spark creativity and expand the imaginations of the children that enter our doors." Callahan, a former writing professor at both American University and The George Washington University, says there is a need in D.C. "to provide one-on-one attention to students at all levels and abilities, particularly to students that can’t afford to pay for this type of support." The new site is close to many schools and is easily accessible by public transportation, which 826DC hopes will bring in both students and volunteers. And volunteers are needed. Opportunities range in time commitment -- from a couple hours volunteering in the store to teaching workshops and tutoring regularly," Callahan said. You can find out more on the 826DC website.